I never realized how much I liked brussels sprouts until I tried them roasted. I have to say the same for my entire family. Everybody loved the way they tasted. Somehow roasting the brussel sprouts brings out a hint of sweetness and really mellows the cabbagie taste that turns most people off of them. 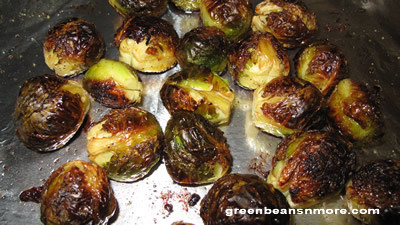 The oven roasting brings out the natural sugars which creates healthy caramelized brussel sprouts. They are extremely easy to make requiring only four ingredients. The first time I made them I used this Roasted Brussels Sprouts recipe from Ina Garten, which I'm including here. Over time I've made a few changes, and learned some things, so please read my "cook's tips" following the recipe. Brussels sprouts don't get much fresher than this. Here they're still on the stalk. I can't always use all of them at one time, so I trim the stalk (you'll need a very sharp knife to do this) and place it in water. I store it in the fridge. I do use them all within a week so that we can enjoy them at peak freshness. 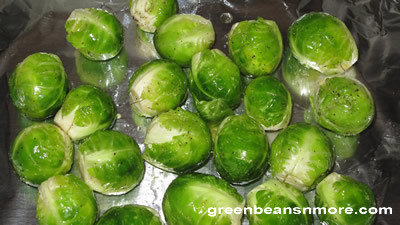 Above are brussels sprouts trimmed, with the outer leaves peeled off, oiled, salted and peppered and ready for the oven. 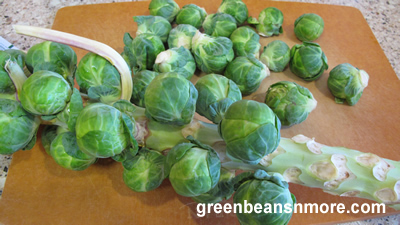 Cook's tips: Choose the smallest and freshest brussels sprouts you can find. Make sure they're all about the same size so they will all cook evenly. If you have very large brussels sprouts cut them in half. Don't wash them. If they're wet the olive oil won't stick to them. Peel the entire outer layer of leaves off. Cut the stem very close and score the bottom with an "x", about 1/8" deep. I have found this helps the sprouts to cook more evenly. They cool off very quickly and they're best and most crunchy right out of the oven, so follow Ina's advice and serve them immediately!